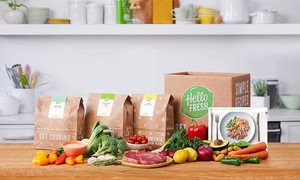 NOTE: I chose Two Weeks of Family Box Classic Meals for Four (Three Recipes a Week; 24 Total Meals) for $70 after coupon code OFF (Retail 210). No way I can go to the store at that price!!!!!!! Promotional value expires 180 days after purchase. Amount paid never expires. New clients only. Limit 1 per person, may buy 1 additional as a gift. Online only. $1 activation fee required. Valid only for option purchased. Shipping included within continental US; does not ship to Canada. Valid delivery areas. Must register credit card with merchant. Subscription will automatically renew at regular price at end of subscription purchased unless canceled with merchant. Modify, pause or cancel delivery any time before 11:59PM PST 5 days prior to each delivery. Not valid with other discounts, offers, or promo codes. Must use in 1 visit. Merchant's terms. Merchant is solely responsible to purchasers for the care and quality of the advertised goods and services.